In my PSK31 travels I have encountered other hams also using a Yaesu FTDX3000 with an external interface such as a Signalink. As the radio has a built in interface I am somewhat shocked by this. And when I ask why are they not using the built in interface the most common answer is along the lines of I was not aware that the radio had it built in. With this in mind I took a few pictures and documented a few settings and leveraging the power of the net and search engines everywhere. Hopefully this blog post on setting up the FTDX3000 for sound card digital modes will prevent a few from doing the hard way, and for those who have already gone the external interface route to change. DO NOT Connect the radio to the PC at this time. Before diving in you will need a few things in addition to the radio and a PC. Visit the Yaesu website and download the USB Serial driver. Obtain but do not connect an appropriate length Type A to Type B USB cable. Your PC will have the rectangular plug and the back of the radio has square type B plug. The driver pack on the Yaesu web site has instructions, follow them and install the drivers. Once installed and the radio is connected and powered up you will get various messages in the windows task bar that drivers and being installed and or have been installed and the device is ready for use. The driver install directions on the Yaesu website details all of this. In this next step we will check and confirm that the drivers are correctly installed. Via the Windows control panel enter the device manager and expand the Ports and the Sound, video and game controllers section. Your port numbers may differ from mine which is ok. However if they are missing you have a problem and need to return to the Yaesu driver installation instructions. Write down the port numbers for the Standard and Enhanced com port you will need these values when setting up the PTT. 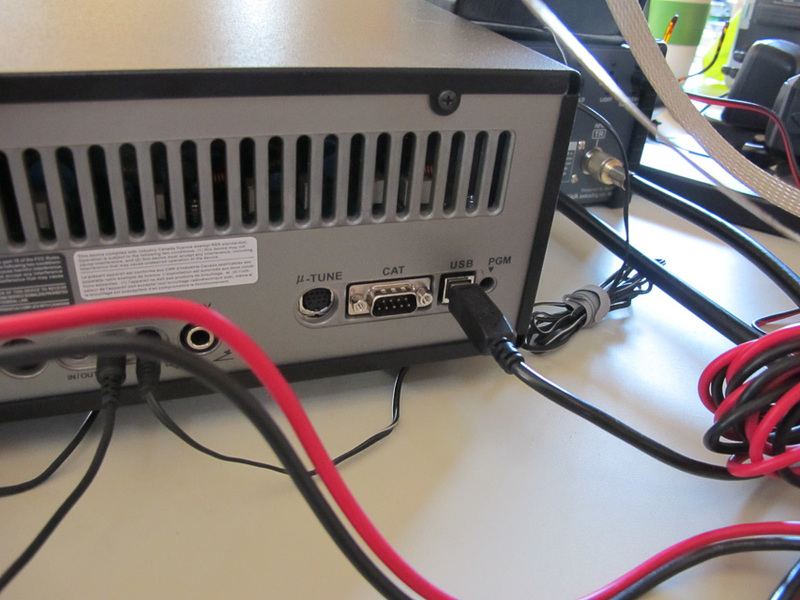 Before we begin to setup DM780 to interface with the radio, we first need to setup the radio side of the connection. When using the 3000 for PSK and other sound card based digital modes. The data mode lets the radio use a different set of interfaces and configuration settings for example from SSB use. Which is nice as it allows you to flip between data and voice modes without having to reset a series of controls. Enter the menu system and change option #65 PC Keying to DTR. Change item #75 to USB, which tells the radio to source TX audio from the USB audio interface. The next two items #76 and #77 is the gain settings internal to the radio between the internal sound card and the audio input of the transmitter and the audio output of the receiver. These are the values which work best for me. Change #037 to use the USB serial port and not the back panel port. Also ensure that CAT RTS #040 is enabled as this will permit hardware flow control with the PC. When you setup HRD to connect to the radio ensure that the “Enhanced port” is being used and that the speed is the same as what was set in radio option #038. Also as shown here ensure that DTR is unchecked and RTS is checked. I will assume that you have already setup the radio control side of HRD to connect with the radio. It is important that when configuring HRD you use the enhanced port recorded above and not the standard port number. Via the DM780 options screen. I prefer the serial line DTR option over via the HRD connection as it is consistent with the CW keying mechanism used in the next section and pulling the USB cable will drop the DTR line. Where as pulling the USB cable or shutting down the PC will not send a TX stop CAT command, to counter the TX start CAT command that HRD would use to place the radio in transmit. Before taking it for a test drive on the air the initial gain level for the USB sound card which while physically inside the transceiver it is logically part of Windows. In my particular installation the FTDX3000 sound card shows up as Speakers “7-USB Audio CODEC” and Microphone “7-USB Audio CODEC”. In your system the number may be different but the rest of the text will be the same. Right click on each device, select properties and levels. Start out will a low level around 10 for you initial trials. You can tweak the TX value in DM780, here in the logical device config, and in the radio menu settings as shown above in the radio configuration section. That should be enough to get you on the air. Perform a few test transmissions to get the the audio levels in DM780, the sound card and in the radio setup options to achieve the ALC levels recommended for your mode. Normally you are striving for no ALC deflection. Set the carrier level in the radio either via the front panel or inside the menu system to the power level desired and have fun. If you have trouble getting the PC to talk to the CAT port on the Radio, I would suggest downloading from the Yaesu website the PCC-3000 package. It presents a very simple interface to the radio and is simple to setup and less may be more by using this simple app to verify radio connectivity. Versus the more capable and more complex HRD Suite. The PCC-3000 package is what you want, very simple to run no installation is needed. 25-July-2015 Update Note!, a later version of this package is now available on the Yaesu website. Use whatever version is available. Thanks to Rick W5FKW for pointing this out. I missed a step, need to setup the radio to use the USB serial port for CAT control and not the back panel serial port. Will be inserting these steps into the guide. Thank you, Jay. I have been trying to figure this out for some time. Your configuration works great! Occasionally, I get an intermittent beep when using DM780 software. Have you experienced this? Do you know what causes the intermittent beep or how to correct the problem? You are welcome, happy to hear that it helped. Where are you hearing this beep from, PC speakers, TX audio? First thing to check is that the default sound card is not the radio as you don’t want the various PC new mail sounds and such going out the radio. Hello Jay, Thanks for the reply. I heard the sound from the radio monitor, it actually transmits a long tone of about one second. A constant tone or with slight variation as in a Reed Solomon ID? Do you have RSID turned on? Also did you look in the windows sound setup and confirm that the default audio device is not the radio interfaces. 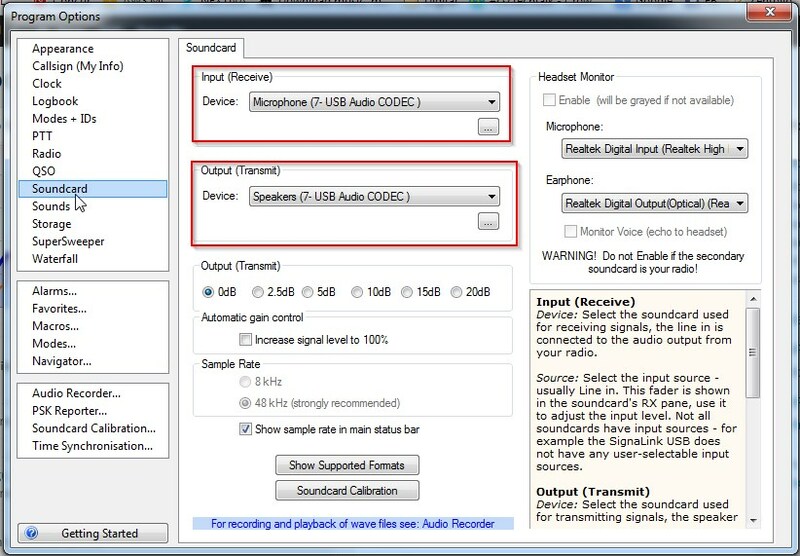 It is a constant tone and the radio sound card (usb audio device) is not selected as default. I did a little more testing by shutting down all the HRD programs and still got the occasional long beep that transmits. When I completely disconnect the USB cable the symptom does not appear. It seems some setting on the PC side is wrong and or sending the signal causing the intermittent transmit. Thanks for all your help. Do you have data VOX turned on (menu item #180)? 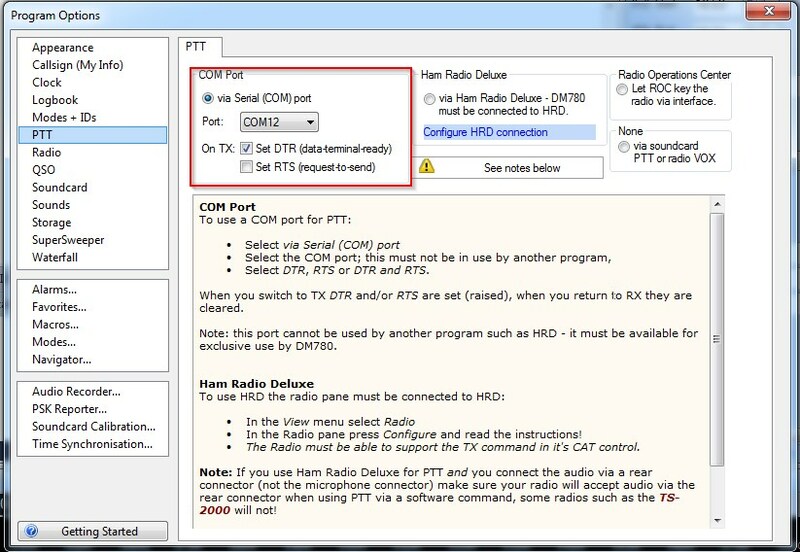 Audio to the radio should not cause it to transmit as the PTT function is accomplished with the DTR line. Well I would shutdown your email and instant messenger or anything else that you have running. Once you confirm no more random transmissions, start to add them back on at a time to find the offending app. Menu Item 180 VOX SELECT is set to “MIC”. I will try you suggestion. Thanks again for your assistance. You have my many thanks for the work you have done in documenting this procedure, and making it available. I am up and running on PSK31 and I love it. I know I will be directing others to this site. Thanks Jay! Your efforts saved me a lot of toil and trouble! Doug thank you for the feedback. By the number of hits I get a day I am guessing that it is helping many more than write. I had to lower 077 to a 2 to stop overloading. Any ideas for the SSTV mode on HRD? That radio setting and the soundcard setting in windows interact, you might want to check the gain in Windows in order to not run the radio level so low. Thanks Jay for this super write up! 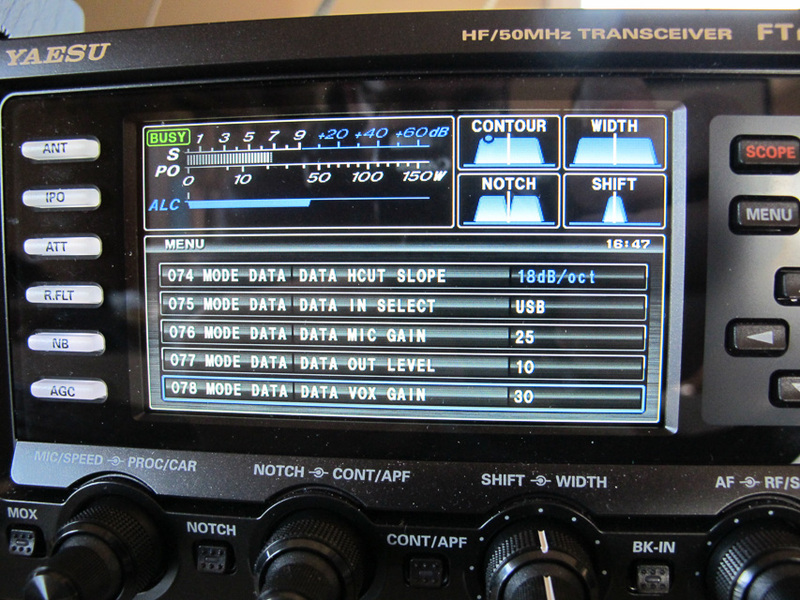 I used your steps to get my FT-991 interfaced to HRD by modifying some of the FT-991 menu items to match your description. 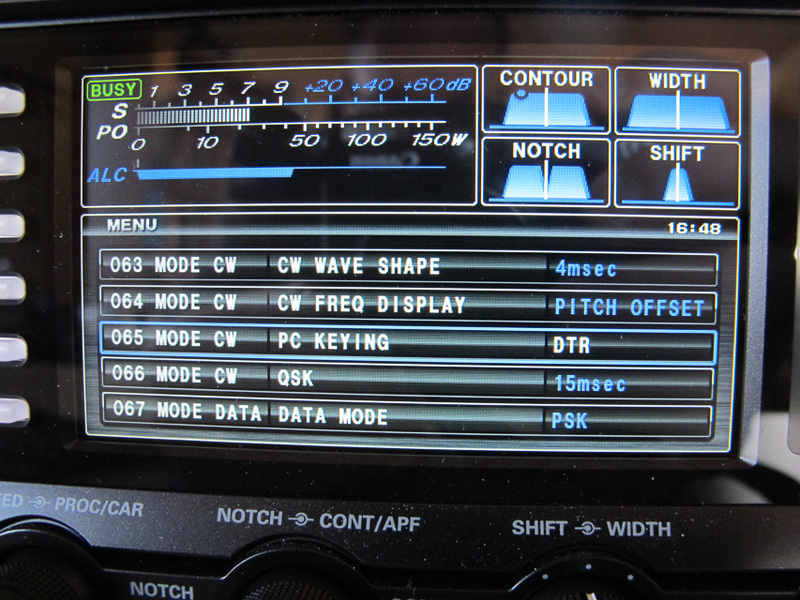 The FT-991 menu *numbers* are not the same as the FTdx-3000 numbers but the setting *names* are the same. I’ll jot down what my FT-991 settings are and post a follow up comment next week. That would be great, I have seen some write ups on the Yahoo FT-991 group. Further: The HRD website has an application note in their Knowledge Base about usage with the FT-991. Go to http://tickets.hrdsoftwarellc.com/index.php and then do a search on FT-991 and it includes a lot of key information which isn’t in their current manual. Very straight forward…One thing I’ve done is to rename the labels under sounds, once inside the Properties, to FTDX3000. Jay, thank you for the information. I don’t use Windows/HRD. I use Ubuntu/FLdigi. 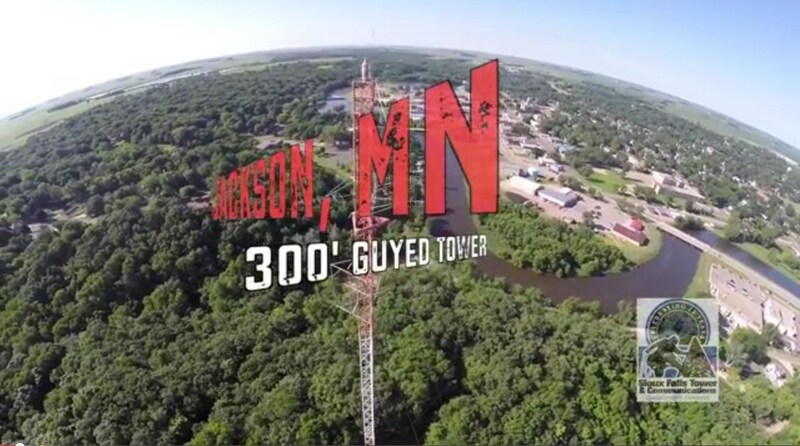 Using your guide I was able to set up the -3000 and FLdigi to receive transmissions. However, when I attempted to transmit the -3000 would go to Tx mode but there would be no output power. Any suggestions from anyone? Also, When using the internal sound card the 20M band was noisy. When I reverted to the SignaLink USB the band was not noisy. A puzzle. Check the audio path from the software to the radio, is fld using the radio speaker device for tx? Are the levels midway as a start? Is the radio configed to use the USB as the mic in data mode and do you have the radio in a data mode such as DATA USB? As for noise on 20m I have not experienced this problem. 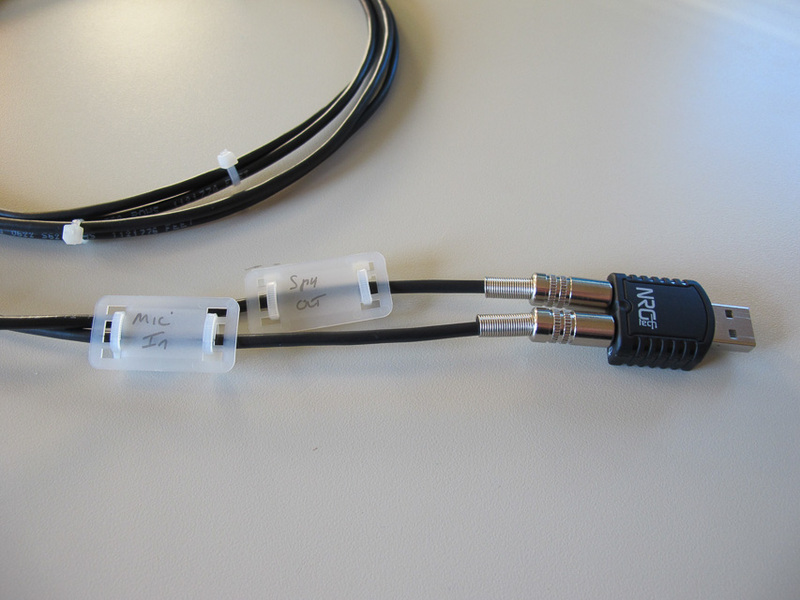 Try putting a dummy load on the antenna port to determine if USB or PC hash is getting into your antenna system. The selected sound device is PCM2903B Audio Codec, digital output and digital input. The levels are close to midway. The rig is set to DATA USB at 14.070 MHz. How do I know if the radio configed to use the USB as the mic in data mode? Hmm, pull the USB cable to ensure that you have the correct devices selected. USB is selected as the Data input via menu option #75, and data mic gain is #76 a value of 20 is a good place to start. What I have discovered is in addition to the other settings there is a Fldigi setting which is key. That did the trick for me, audio makes it to the radio. I also tried FLdigi in Windows XP. Same problem, good copy but no power output in TX mode. Pseudo-FSK on right audio channel. No luck. Now the waterfall is frozen. I’ll stick with the SignaLink USB. Sorry you could not get your setup to play. Running Ubuntu 15.04 and installed Fldigi via software Center and got 3.22.04. Using Hamlib FTDX5000, PTT via Hamlib command. I had to add my user to the dialout group to get this to work, hamlib was unable to open the port. And it plays just fine. Updated to Fldigi 3.23.01 via link below and sure enough it stopped playing. Had to enable “Modem Signal on left and right channels” to get it playing again. Well, Jay I got the system to work. Enable “Modem signal …” helped. I’ll send you the complete steps I used. Awesome, I will look for it. Hi Jay. Thanks so much! Thanks to your guide I was able to get CW and PSK working perfectly on my FTdx-3000 using HRD. Thank you, my material was very helpful, I avoided an expense in addition to a new interfta everything works in the best conditions. The information is really useful. Awesome, thank you for note it is always nice to hear from hams around the world. Well done Jay, couldn’t be any clearer… My question is can you use the computer speakers to hear your SSB phone communications? I have not been able to get audio from my FTDX-3000 to my Corsair computer speakers… Any information would be greatly appreciated. 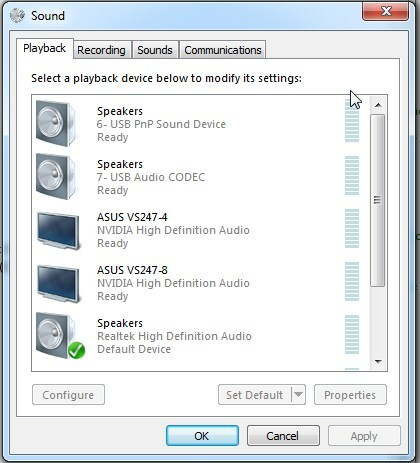 Sure you can easily listen to the audio out of the radio on your PC speakers or PC headphones whatever is the default Playback device. 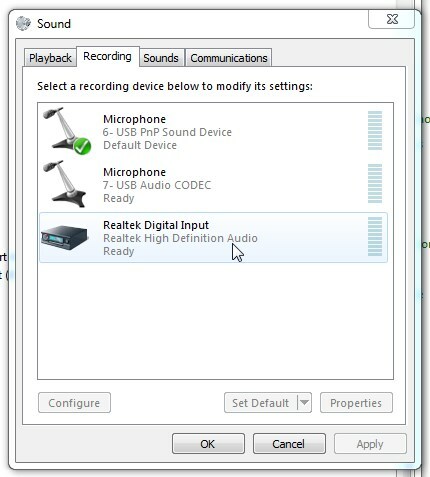 Enter the sound settings in Windows and in the properties page for the Recording device which is the Radio. This is normally a “USB Audio CODEC”, I have named mine Yaesu. Select the listen tab and check and apply the “Listen to this device” option. Any audio received on this recording input will be shared to your “Default” playback device. This is a good question, I will take some screen shots and post a quick article. Made the changes, initially it didn’t take even after a reboot. I ran the trouble shoot utility in Windows 10 and it fixed the problem. Wondering if there are some other settings to make the sound better. The sound is clipping (a strong raspy sound from all the voices). The speakers are Corsair SP2500’s and the audio quality for music is just astounding (HD quality) so i expected much more on the audio from the radio… I did adjust the levels from 10 and up and didn’t make any impact, sound is still clipping… Any suggestions? I know this might be getting out of your realm of things but I thought I would ask! Rob I would check the gain levels from the radio all the way to the speakers as it sounds like you might be experiencing clipping somewhere in the audio path. A question about using for example logger 32 and MIXW at the same time connection (frdx3000) to the pc has been made with an USB cable? I can’t use the 2 programs at the same time with the same serial port.How can i fix this?I’ve tried setting up extra com ports and bridge those but not sucessfull so far. Simplest solution is to use Ham Radio Deluxe, another option is to try the two serial ports which the Yaesu driver presents as standard and enhanced. 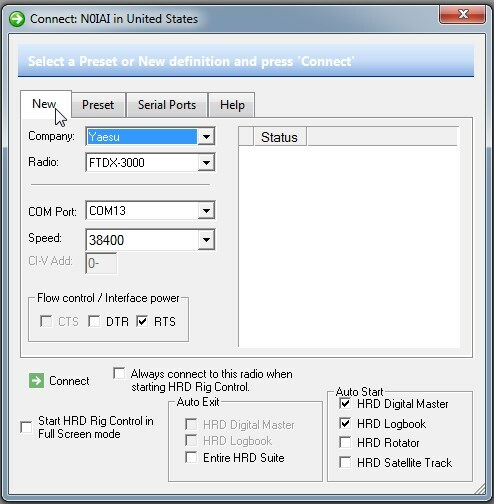 Server software packages being released are beginning to offer a config option to use HRD to command the radio. 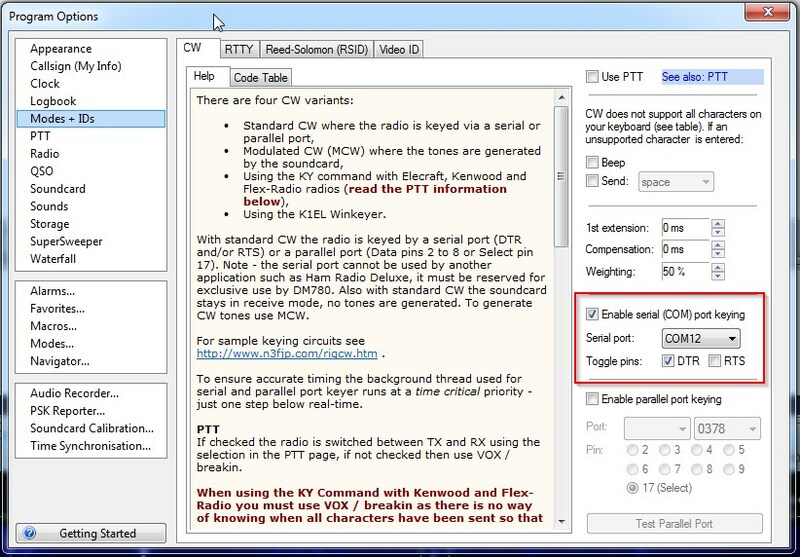 The JT65 package WSJT is an example which comes to mind. Using the USB connection is the simplest approach as it provides a virtual serial connection as well as the audio connections. If you are looking to operate any of the digital modes then you will need an audio path between the PC and the radio. If you just want to control the radio from your PC then a serial connection either via the RS-232 9 pin connector or via the virtual serial port presented via the USB connection. Hope this helps, feel free to ask followup’s. Hi Jay, Doug– AA0DW here… I first commented in July to say “thanks” for a great tutorial. Thought I would share that I just finished installing a new mobo/cpu into the shack computer. As I attempted to get the set up working again, I was getting frustrated in that everytime I tried transmitting a digi mode with dm780,it would begin xmit and then abruptly stop,causing the software to lock up. I determined after much toil that my usb cable was at fault! Once I switched to a cable with better shielding and a toroid,all was well again! So to anyone just beginning the process–MAKE SURE YOUR USB CABLE IS WELL SHIELDED AND INCLUDES A TOROID! Thanks Doug, yeah if you have high RF levels in the shack it can play havoc with all sorts of things. Glad you got it working. They will work independently ,but I get a error DDE 13694. It did work at one time. I cannot figure this out. I have no experience with that device, I would try the support group for someone with the same combination or a better understanding of the error codes. You mentioned setting the radio CAT control to USB instead of the rear serial port. Does that mean that you are now unable to use an external tuner (which use that RS232 port)? Or can you still use the USB port just for audio and PTT via CAT? From my experience the USB and DB-9 cat port are mutely exclusive, they will not work in parallel. If you have an external device which depends on the DB-9 CAT port it will need to provide a pass-thru in order to gain access for computer control. And yes from experience you can use the DB-9 serial for CAT and the USB for the sound card. I still have issues with transmit on the FTdx3000 in all MARS digital modes. I use FLDigi, MS-DMT, MARS-ALE. I can receive using the internal sound card, but cannot transmit at all. I’m sure there has to be a menu setting but I just have not been able to find it yet. The signalink worked most of the time. I would just rather use the internal sound card in the 3000 if possible. Happy to help however need more data. Assuming that you have configured the radio per blog post. What is your rig control config in FLDigi and what serial ports is the radio presenting, look in control panel->device manager->ports. FLDigi presents several options for Rig control, RigCAT, Hamlib etc first step help me understand your setup. I did not find the setup in the blog posts for internal sound card so need to look at that first I suppose. As for FLDigi, I’m not actually using it with the CAT but just sending MT-63, Olivia, and other digital messages. The only CAT use will be for MARS ALE. All programs work with the signalink, but it apparent has some RF issues at times and has given me port audio errors, so I’m attempting to by-pass it and go the internal sound card. This blog entry you are posting a comment to contains the setup instructions. Just ignore the Ham Radio Deluxe parts. If you do not have the CAT working then I am not surprised at the problems you are having as CAT commands or the CAT port is how the PC tells the radio to transmit. I do have the CAT working, or at least it worked fine with the signalink. It just does not automatically change frequencies or scan in the ALE program (yet). I’m sure it is a configuration issue in ALE, or perhaps a menu item in the 3000. Yaesu provide a bit more information. I can now transmit by using similar commands in your blog for right and left channels. I used the following menu items: 065-OFF;067-PSK; 068-1000Hz; 075-USB; 077-50; 085-FRONT; 103-FRONT; 180-DATA; 181-40ms; Radio SSB and select VOX-ON. I also have the FLDigi settings if needed. With the above settings you are using VOX on the data path, setting 180 should be set to Mic so VOX works with your front panel mic. 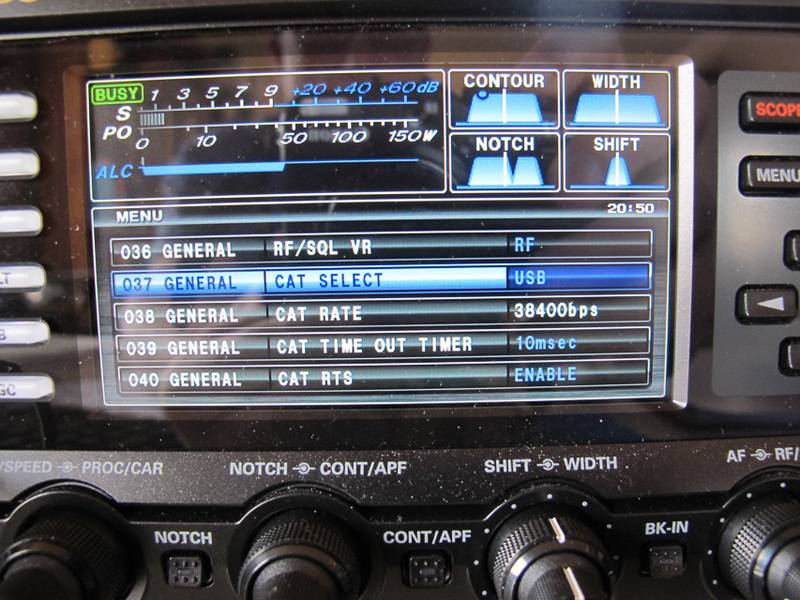 FLDigi, HRD or whatever will command the radio to TX via a CAT port command. You should also put the radio in DATA-USB when working digital modes. This tells the radio to use the inputs defined for DATA (MODE DATA in the menu). You have many of the options setup correctly just don’t have the radio in the correct operating mode. Hi. I have been using FTDX-3000 for a couple of months now. I have been using rig mode (USB) rather than rig mode DATA USB. This is because DATA mode puts a positive shift if 1000Hz to the audio spectrum. Thus if I want a base frequency of 7.040MHz I have to set my radio to 7.041MHz. There is a menu setting (menu item 068) which permits to change tis offset, but unfortunately there is no zero offset; only 1000, 1500 and 2000Hz. Where am I going wrong? Menu item 68 affects the center frequency for the built in decoder, you can see this if you put the radio in PSK decode mode. The “C”enter in the AF-FFT window will move around if you change the value of 068. As for the offset this is only true if you have setting 067 set to other which is intended for Packet use. If set to PSK then the carrier center frequency is what is on the VFO display and the audio offset as set in DM780 as an example. And where you transmit is the sum of the two when using the typical DATA-USB mode, Carrier + Audio Offset. Thanks for the quick response Jay. Unfortunately, my offset problem occurs with Menu Item #67 set to PSK and I can’t reduce the offset – only increase the offset further with Menu Item #68. There are just three setting in Menu Item #68 : 1000, 1500 and 2000Hz. A setting of zero Hz would be useful. The manual doesn’t shed much light on PSK operation. I personally think the 3000 is a great rig but the on screen decode is just a sales gimmick. My current workaround (it may not be correct or as Yaesu intended)) is to set Menu Item #67 to OTHERS and then take the offset out by setting Menu Item #69 Mode Data Other Disp (SSB) to 1000Hz. Of course I have exactly the same problem with JT 65, JT 9 and WSPR data modes. I find the manual very confusing if Data is only referring to packet data. Another related issue is that the Data High Cut filter settings only reduce from a bandwidth defined by the WIDTH control of 2400Hz, yet the manual implies this bandwidth should be capable of setting up to 4000Hz. I have no problems setting up data modes with my FT897D. Just found a website that backs up my setting of Menu Items #67 and 69 above. congratulations you found someone else who has chosen to create their own solution best of luck to you both. If you follow my setup guide and operate the radio in DATA-USB mode no audio offsets are applied and camping on 1000hz in DM780 will result in 1000hz offset from the carrier out of the radio. You can see this if you enable “moni” and enable the audio portion of the waterfall and transmit a test message. The two will track no offsets are applied. To use a US term you are getting wrapped around the axle with this, follow the setup guide ensure the radio is in DATA-USB when you operate PSK. 067 Data mode, PSK and ensure that the radio is DATA USB mode when operating PSK. If you have this set to “Other” that is for packet operation which is a completely different kettle of fish. If you do not have the radio in “DATA” mode the the MODE-DATA Group settings do not come into play. The following setup items are not applicable when the radio is in data mode, do not be distracted by them. 068 PSK Tone, This affects the built in radio decode center frequency. No impact to applications using the sound card. Hi. I have been using PSK31 with DM780 and FTDX-3000 for 2 months now. I have to use rig mode (USB) for correct operation. If I use rig mode (DATA USB) then my audio spectrum is always shifted by 1000Hz which is the default PSK tone set by menu item 68. There is no zero PSK setting (only 1000, 1500 and 2000Hz) to counter this offset. What am I doing wrong in my setup? I am only reporting what I observe Jay. I am sorry if I have offended you as that was never my intention. I was simply referring you to observations and advice from a fellow ham on this same topic. I respect your views as I respect the next person’s views. I am following your entire guide, except that for success with my station, I adjust Menu Items #67 to OTHERS and Menu Item #69 to 1000Hz. In my previous comment I omitted to say that the radio was operating DATA USB mode. Sorry for that omission. When I do as you suggest (in your guide and comments) I do see a real 1000Hz offset in DM780 spectrum display. I know this for sure, because I observe the WSPR signals between 1400 and 1600Hz above the WSPR carrier VFO /DIAL frequency of 7.038.600MHz. The WSPR signals are transposed from the usual 0-200Hz up to 1000-1200Hz on DM780 display and the PSK waterfalls are also transposed up by the same 1000Hz on the DM780 display. I agree 100% with you, that if I camp on 1000Hz then I observe my signal on the 1000Hz marker of the AF-FFT display. The AF-FFT display is relative to my VFO/Dial frequency and will only shift on this display if I change the PSK Tone using menu #68. My problem is that my VFO/DIAL Frequency has been shifted 1000Hz by the default setting of Menu Item #68. If I could change #68 to 0Hz then I would, but that is not possible. It is only possible to shift up to 1500 and 2000Hz. Menu Items #67 to #79 are all Data Mode Items. The Yaesu manual does not define “OTHERS” so far as I can see. I am using latest Jan 26th 2016 software with my rig. Jay, your guide and comments have certainly helped me so I thank you sincerely for that. With your help, I can now get the PSK mode (and all other data modes) to work in the rig’s DATA USB mode. I am following your entire guide except that for success with my station I adjust Menu Items #67 to OTHERS and Menu Item #69 to 1000Hz. I also set Menu Item #76 to MCVR which enables front panel transmit drive level control. Not sure what the acronym MCVR actually stands for! I’ve googled it, but all I get is Yaesu Handbook references to it! 73 Keith (G3WGE) aged 68 years and a hard boiled reactionary! Or, you can never teach an old dog new tricks. No worries Keith the issue you raise is a complex one as the DATA mode can and will be used for multiple modes. Some of which will be a bit cumbersome with the 1khz PSK mode enabled. This feature can be disabled via setup option 067 and 070. I was able to set aside time to capture all of the screen shots and such and created a post on the subject. Thanks for raising my awareness to this “feature”. I just sent you a email in reference to my power out problem, not being able to adjust it down far enough to clear up the ALC reading. But for that, I followed the instructions you laid out and, out of the box, the radio and HRD/DM780 worked as you described. Thanks for the information and all the time and effort you put into the mod. It’s truly a great mod and free’s up the Navigator for my new FT-450-D. Thanks so much Jay. While not technically a mod I do appreciate the feedback. Was is your value for #076 data mix gain? I run mine at 25 and run the level on the “speaker” in HRD at around 20 percent. Jay, I run #076 at 30 and the speaker at 15, so we are both basically the same. Instead of just setting it and forgetting it, I ran many combinations and found those settings to be right for my 3K, but they may, and probably will, change depending on the owner taking the time to try the many. It’s very time consuming but I learned a lot by doing it. I know that in the strictness of definitions it’s not a modification, but at this time that’s the best term I could come up with. I am in the process of wiring the digital interface cable for my 450, and since no electronics store in Round Rock or Austin has one, waiting anxiously for the Dongle I had to order off E-Bay. I’ll keep you posted. I was looking for “adapt”, “adapting”, “adaptation”. I am trying to get Ham Radio Deluxe and my FTDX3000 to work with the USB cable alone. It is doing fine on the Radio side with all the receive and such, but when I bring DM780 up and try to use CW I can receive all fine there, and if I do a connect using my Com Port 7 it sends my marker tone out and keys the radio up. I can also key all up with using Break in or my Mox button in HDR, but cannot get a tone out when using DM780 in manual or auto mode. 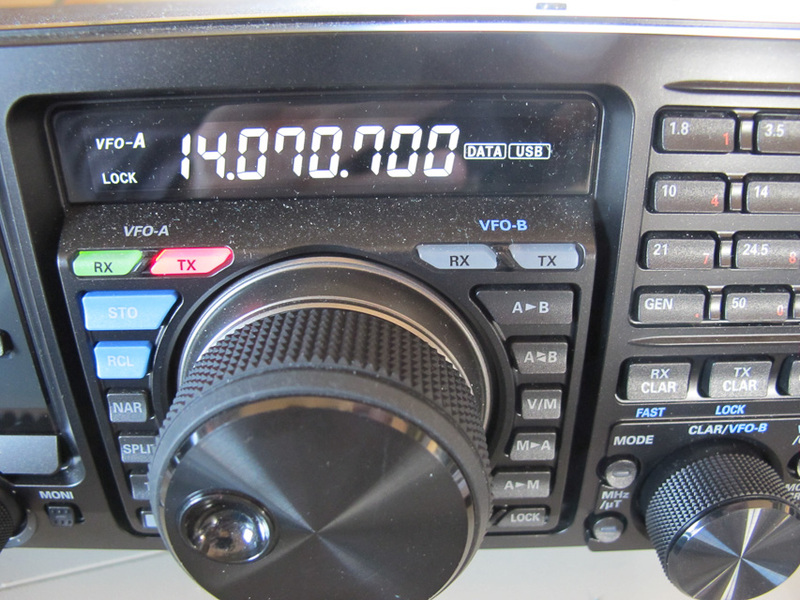 Let me first understand your setup, have you configured your radio and HRD per the instructions in this post http://morsetutor.com/2015/02/yaesu-ftdx3000-digi-setup/ ? If you do and place the radio in CW mode it will work with DM780 in CW mode if the instructions are followed. You mention the lack of tone be sure you are using “CW” mode in DM780 and not one of the other options such as CW (SSB). The setup is not to send a SSB modulated tone, rather just a CW carrier. I think I followed all the setups to the T. All seems to be working fine in HRD, I can transmit a CW message when I hit the Moni key. When I go to DM780 is when the problems seem to come about. I can hit connect and it sends a tone out, and power also, it is when I hit a auto or manual message, it flashes the transmit, but doesn’t send any tone out for such. As I said before, I have this going through only a USB cable and all seem to be setup ok. Not using an extra sound card. I am using CW, but there is something it is just not doing right. Jay, did a lot of messing around with things last night, to MAKE sure all was set right, and low and behold things started working. Made a few contacts to Spain from the States, thanks for the help, and pushing me to make it work. Jay, thanks for posting this gem. You’ve got me started on an exciting journey! All I can say is Wow! Thank you for having the expertise and taking the time to put this together. Buck, you are most welcome thank you for the feedback. Great and you are most welcome. Hi Jay, having just bought my 3000 I’ve found this very helpful in setting up my radio. As digi modes is my main mode of operating I appreciate this very much. Gary, you are most welcome enjoy the 3k. Now if only someone could Document this for Debian Linux so I could make FLDIGI work with my DX3000. All of the radio setup guidance remains applicable. On the PC side download and install this driver https://morsetutor.com/2016/01/yaesu-usb-driver-update/ and I think you are there. I tried is once perhaps with the intent to document, don’t recall the specifics. I do have a half written post on running FLDigi on a Raspberry PI, it was underwhelming performance wise so I did not finish it up and publish. Give the driver a try and report back please. What cable(s) are needed to connect the FTDX3000 to laptop to use FLDIGI or HRD DM870? For the life of me I cannot find any cables for this. Manual tells me to use the RTTY plug. In the post the cable type is mentioned, easy to miss. I have added an Amazon link, if you need to purchase. In windows Device Manager enable View->”Show Hidden Devices” and take a look. Do any of the ports show up with an error icon? Hi Jay, tnx for the answer. The port com 3 and 4 appear hidden, but without error icon. I tested if setting menu item # 037 to RS232 would result in the problem you are seeing. I was not able to reproduce the issue you are seeing. I would contact Yaesu tech support it may need to go back for repair. Thank you for the feedback, I am happy to hear the article helped you. Thanks for the info. I am having a problem, every time I connect my radio to DM 720 it keys my radio. I have made sure I have followed your instructions but I can not figure it out. The radio just stays keyed without sending anything. What is menu item #65 set to? If not off set it to off does the radio still key when DM780 is opened? I’m not able to get audio to my 3000. I followed your instructions and still have the problem. One thing I noticed is that your picture of the Sound Playback shows Realtek High Definition Audio , Default Device. my PC shows this choice greyed out. I have mine set to Speakers Audio CODEC, Default Device. Is Realtech etc, choice supposed to be available? I love your write-up. Very easy to follow. I hope it’s my issue with not having the Realtech choice available. Don’t let the Realtek devices distract you, these are the built in speakers and microphone devices on my PC’s motherboard. Your PC may be different and whatever device names you PC has this is what you should be using for the Windows default speaker and microphone. The radio sound devices are never used. I need additional information before I am able to diagnose your issue, let’s start with some basics. 1) Did you install the Yaesu drivers prior to plugging in the USB cable to the PC. 3) What sound devices have you selected in the application? 4) You mention that you “not able to get audio to my 3000”, RX works then just a TX problem? The one thing that got me at first was not hanging the audio input from the mic jack on the front to the USB port. Are you referring to the need to change the settings to use USB for input when in data mode. You need to use the USB port as input if you are using and input from your computer, data or Computer generated CW.